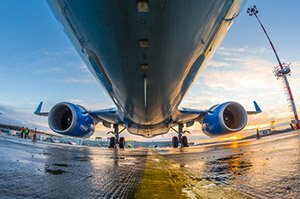 The Boeing Co. (NYSE: BA) nearly doubled its share price in 2017 when it rose a whopping 98.4%, from $155.68 to $308.84. Over the same time period, the S&P 500 climbed just 22.5%, for comparison. Behind the stock’s stellar performance is a massive backlog for more than 5,860 passenger jets. And it still has upside remaining, but after its incredible run, new investors shouldn’t expect it to double again anytime soon. That’s why, in a bit, we’ll reveal another excellent defense stock that we expect could double your money in 2018. That’s pretty good for a stock some had written off as boring and mature. And all the while, Boeing’s innovation in aerospace never stopped. Boeing’s super-efficient 787 Dreamliner is still way in front of its biggest rival, Airbus and its A380 Mega-Jumbo. And the innovation doesn’t stop with passenger jets. The company also has a solid foothold in the drone business. Our mission at Money Morning isn’t just to find you high-quality stocks. We’re also looking out for the highest possible returns on investment with reasonable risk. Lockheed Martin Corp. (NYSE: LMT) is one of the world’s premier defense contractors. The company’s annual revenue recently topped $47 billion per year, and profits reached $5 billion. And last year, company executives raised LMT’s annual profit growth forecast by 5%. In addition, Lockheed is also a prime beneficiary of one of Money Morning Chief Investment Strategist Keith Fitz-Gerald’s “Unstoppable Trend” of defense. The other “Unstoppable Trends” are technology, medicine, demographics, scarcity & allocation, and energy. Because the constant threats of war, terrorism, and other conflicts are virtually never-ending, there will always be demand for defense companies like Lockheed Martin. And Lockheed is one of the world’s leading companies in supplying defense products to governments and organizations across the world. It’s so profitable that it’s able to pay out a huge $2.00 per share dividend every quarter, or $8.00 per year. At the current share price of $357.78, that represents a dividend yield of 2.34%. Like Boeing, Lockheed’s stock performed exceptionally in 2017, with a nearly 32% gain. But we expect it to more than double by 2019 because of strong demand for its cutting-edge military jets. Lockheed’s black budget program, codenamed “Skunk Works,” has been developing a jet that is expected to fly six times the speed of sound. Named SR-72 “Son of Blackbird,” after its predecessor, SR-71 “Blackbird”, Son of Blackbird is expected to become the first production hypersonic jet. It’s expected to come into service sometime in the next decade. Lockheed is partnering with Aerojet Rocketdyne Holdings Inc. (NYSE: AJRD) to develop the hypersonic engines for Son of Blackbird. And make no mistake: Boeing is also working on hypersonic jets. Now, officially, the Son of Blackbird isn’t flying. But in October, a plane was reported flying high in the skies over the Oregon-California border. But it had no transponder to identify it, and radar had trouble picking it up. Yet the Air Force didn’t seem really concerned about going after it. Patalon and Fitz-Gerald have covered this industry long enough to recognize secret military testing when they see it. The space the plane was spotted in is fairly close to Area 51 in Nevada. Area 51 is a top-secret U.S. military base, home to the most cutting-edge aircrafts of the past 50 years. Area 51 is so secret, the majority of the U.S. armed forces don’t know what’s being tested there. 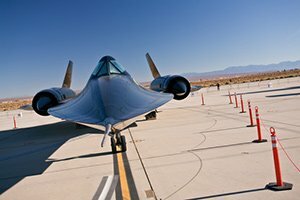 Daily & Defense Report, an industry trade publication, reported last fall that a prototype of the SR-72 was seen at a California “black project” manufacturing plant. Journalist Guy Norris reported that a pilotless subscale version was spotted flying into an Air Force facility in Palmdale, where LMT’s Skunk Works is located. A subscale model is smaller than the real thing, but big enough to fly. So if it was flown there, it’s almost certainly being tested in flight. And that means it may be the plane spotted in October. If it is, that’s excellent progress that will bode well for Lockheed’s future profits.